Midterm voting intentions remain divided: 47% of voters say they plan to vote or lean toward voting for the Republican candidate in their district, while 43% support or lean toward the Democratic candidate. However, the Republican Party has improved its position since last October, when the Democratic Party held a 49%-43% advantage on the generic ballot. At this stage of the campaign, independent voters are 16 points more likely to say they plan to vote Republican (49%) than Democratic (33%) in the midterm. Overall, men back the Republican candidate for Congress in their district by a 52%-39% margin. Women are about evenly divided in their voting intentions: 47% support or lean toward the Democratic candidate, 43% back the Republican. Across education levels, those without a college degree favor GOP candidates on the generic ballot, while college graduates tilt Democratic. 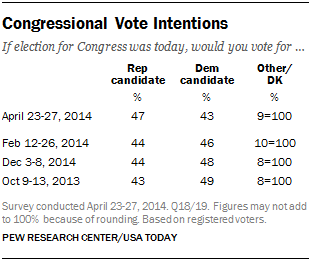 For more on 2014 voting preferences among demographic groups, see the detailed tables in the back of the report. Amid a sluggish economic recovery, the job situation is the top midterm issue for voters, with health care and the budget deficit following closely behind. Nearly half (48%) of voters say the job situation is the most important or second most important issue to their vote, 42% say health care is a top voting issue, 38% name the budget deficit and 31% name education. Security and anti-terrorism policy (19%) and immigration (14%) are seen as less important midterm issues, out of the six tested in the survey. 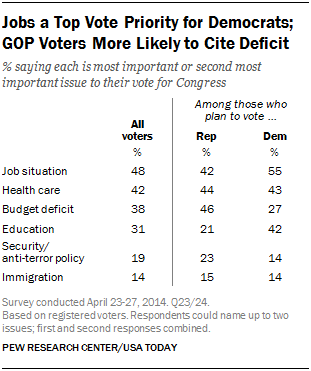 Jobs are the top issue for voters who plan to vote Democratic. More than half of Democratic voters (55%) cite jobs as their most important issue or second leading issue. Republican voters give about equal importance to three leading issues: the budget deficit (46%), health care (44%) and the job situation (42%). Republican voters who agree with the Tea Party are more likely than those who do not to cite the budget deficit as a top voting issue (54% vs. 44%). Currently, 53% of registered voters say that the issue of which party controls Congress will be a factor in their vote, 43% say this won’t be a consideration in their vote. 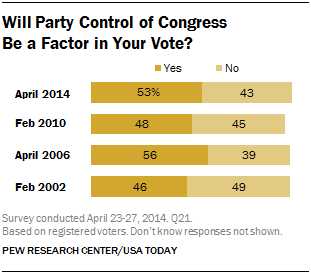 In February 2010, 48% of voters said partisan control of Congress would be a major factor in their vote and in April 2006, 56% said party control would matter. In 2010, partisan control of Congress became a more important issue over the course of the campaign. In the Pew Research Center’s final reelection poll that year, 62% said partisan control of Congress would be a factor, up 14 points from February 2010. Voters who support or lean toward the Republican Party’s candidate in their district (59%) are more likely than those who plan to vote for the Democratic candidate (52%) to say this issue of party control will matter in their vote. This balance of opinion is about the same as at a similar stage of the 2010 midterm campaign. In the final poll that year, 71% of GOP voters and 64% of Democratic voters cited partisan control of Congress as a factor. 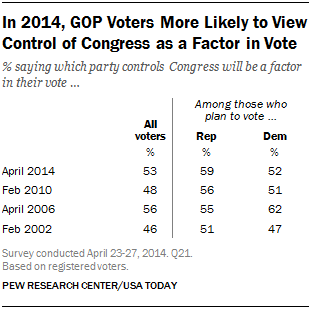 In April 2006, more of those planning to vote Democratic (62%) than Republican (55%) said the issue of party control would be a factor in their vote for Congress. Currently, 42% say their view of Obama will be a factor in their midterm vote: 16% say they consider it a vote “for” Obama while 26% say it is a vote “against” him. In February 2010, about as many said their view of Obama was a factor (44%); they were divided over whether it would be an expression of support for Obama (24%) or opposition (20%). Near the end of the 2010 campaign, 55% of voters said their feelings about Obama would be a factor in their vote, with 26% viewing their ballot as a vote for the president and 28% against him. 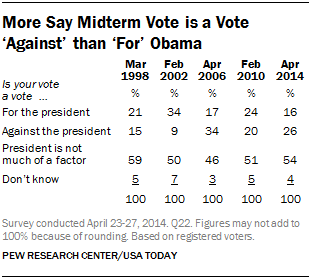 Among those planning to vote for the Republican this fall, fully 46% think of their vote as a vote against Obama. By comparison, fewer of those who plan to vote for the Democratic candidate say they think of their ballot as a vote for Obama (31%). Democratic voters were more likely to say they were backing the president with their midterm vote in a February 2010 survey (47% then, 31% now). 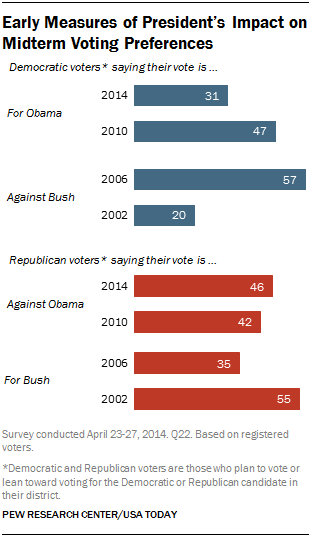 Republicans are about as likely to say they are voting against Obama at this point in the 2014 cycle as they were in February 2010 (46% now, 42% then).